This data set contains a single comma seperated text file (*.csv) of half-hourly average CO mixing ratios measured from2001/04/18 to 2003/08/29 in the old-growth upland forest at the Pará Western (Santarém) - km 67, Primary Forest Tower Site. This site is in the Tapajos National Forest located in north central Brazil. CO concentrations were measured in air drawn from above the canopytop of tower (approx. 64 meters) using a TEI 48CTL instrument modified for increased stability and sensitivity. The sensor was frequently zeroed by passing ambient air over a CO oxidation catalyst. The span was checked 4 times daily by sampling calibration gases at 100 and 500 ppb. Time in the file is given in UTC (decimal date) at the start of each half hour interval (Boian et al., 2006). Associated meteorological parameters, CO2 concentrations and micrometerological fluxes are available in LBA-ECO CD-10 CO2 and H2O Eddy Flux Data at km 67 Tower Site, Tapajos National Forest. This data set contains half-hourly average CO mixing ratios measured at the km67 eddy flux tower site in the Tapajos Forest near Santarem. Date/time in the file is given in UTC at the start of each half hour interval. Missing values are represented as -999. The data set covers the period 2001/04/18 to 2003/08/29. Based on 2 times thestandard deviation of the mean of zero measurements, the minimum detection limit is on theorder of 10 ppb. Based on the standard deviations of the means of replicate sample and calibration gas measurmements,the minimum resolution is 10 ppb or better. 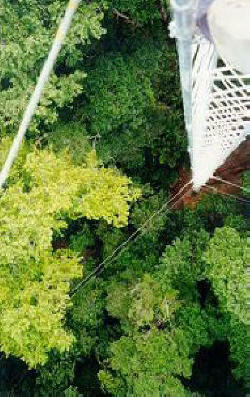 Thermo Environmental Instruments model 48CTL analyzer inlet is located above the forest canopy at top of tower. The CO concentration data was determined using gas-filter-correlation IR absorption on a Thermo-Environmental Instruments 48CTL. Ambient air was dried by condensing water vapor at 2 deg C. Background instrument zero signal was determined every 15 minutes by removing CO from ambient air using a Sofnocat oxidizing catalyst. Instrument gain was determined by calibration with standards at about 100 ppb and 500 ppb CO. Raw data were initially separated into ambient sample, zero, low calibration, and high calibration, and transitional. Transitional data representing data immediately after switching modes were not used. 1-minute averages were computed for the zero, calibration and ambient signals. Zeros were subtracted from ambient and calibration signals to generatedifference signals. The two calibration values were used to construct a mean calibration curve, which was then used to convert the ambient signals to concentration. 1-minute average ambient concentrations were then further averaged to the half-hourly reported values. Saleska, S. R., S. D. Miller, D. M. Matross, M. L. Goulden, S. C. Wofsy, H. R. da Rocha, P. B. de Camargo, P. Crill, B. C. Daube, H. C. de Freitas, L. Hutyra, M. Keller, V. Kirchhoff, M. Menton, J. W. Munger, E. H. Pyle, A. H. Rice, H. Silva, (2003) Carbon in Amazon forests: unexpected seasonal fluxes and disturbance-induced losses, Science, 302, 1554. Boian, C., V.W.J.H. Kirchhoff, W. Munger, S.R. Saleska, S.C. Wofsy (2006) Very High CO Mixing Ratios at a Primary Forest Site, Revista Brasileira de Meteorologia, 21, 20-28.